We have had a super fun weekend here in Los Alamos. They go ALL OUT for Halloween. We're talking parties, and parades, and special performances. 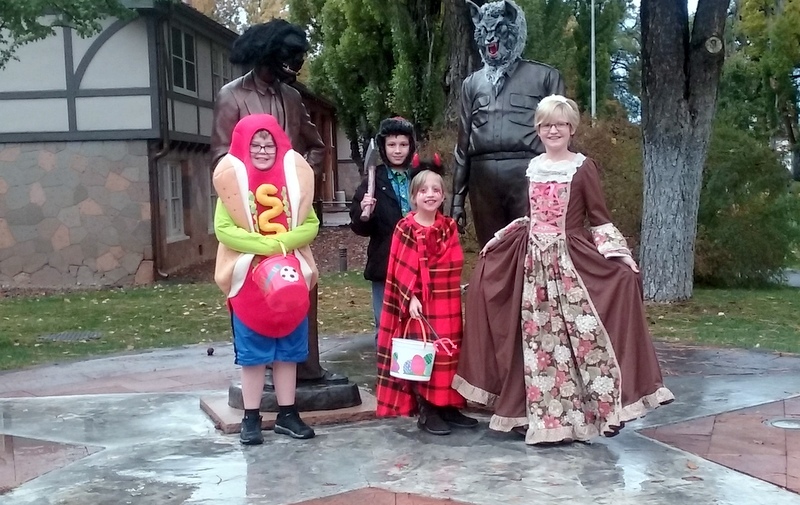 Thaddeus was a lumberjack, Blayne was Isabella Bird Thorne (or a beautiful girl from the 1800's), Daniel was a hot dog, and Taylor was a little devil (at least on this particular day... she wore a different costume to every event). We went trick or treating downtown. It was a lot of fun! They closed off the road, and all the shops had tables outside and were passing out candy and toys and lots of stuff. At the hardware store, they had a wheelbarrow FULL of candy, and they literally took a shovel of candy, and dropped it in our buckets. My kids made out like bandits. In fact, when we got home, they gave me all their reject candy, and that's what we passed out on Halloween night. Meanwhile, do you see this weeping angel? We HAD to take a picture with her. This was by far the best costume, because the girl that was wearing it would just FREEZE and not move. She was super creepy, and scared so many people. It was hilarious and fun to watch. Also, if you don't know anything about the weeping angels, then you need to watch some Dr. Who and get your geek on. 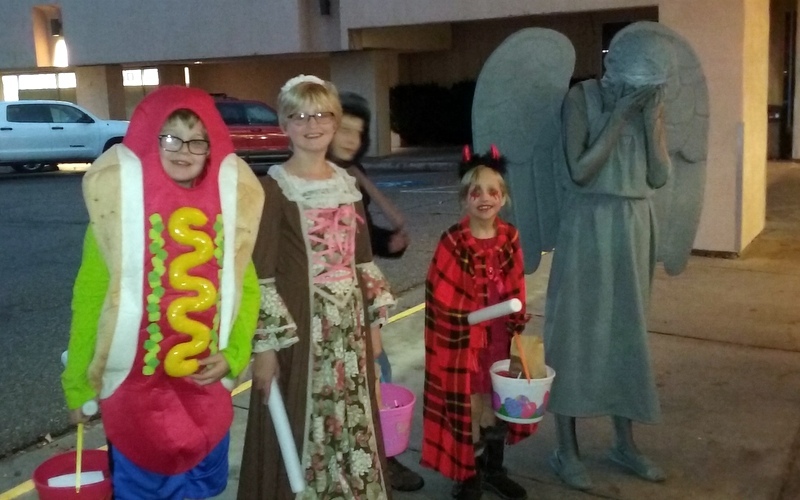 We also attended our church's Trunk or Treat. I put the kids in charge of decorating our car, and they did a fantastic job. They took some branches from our trees and made the back of the car look like a haunted forest. They strung spider webs across the branches, and then they put our creepy stuff all around: skulls, ravens, pumpkins, etc. For the trunk or treat, Taylor wanted to be a dead girl, so we painted her face like a sugar skull, and she wore her black cloak over a black and white polka-dotted dress. All in all, we had a wonderful time!